Edinburgh, National Gallery of Scotland, no. D4870 recto. PROVENANCE: Purchased from H. M. Calman in 1962. Frank Davis, “A Page for Collectors. Attending to Details,” Illustrated London News, Vol. 242, January 19, 1963, 93, as Rosso, for his fresco in S. Maria della Pace. Hirst, 1964, 122, 123, Fig. 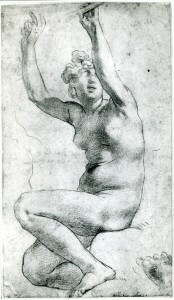 22, as Rosso’s study for Eve in his fresco of 1524 in Rome. Between Renaissance and Baroque, 1965, 110, no. 370. Old Master Drawings, A Loan Exhibition from the National Gallery of Scotland, Colnaghi’s, London, 1966, no. 11. Andrews, 1968, I, 110, II, Fig. 750. Monbeig-Goguel, 1971, 11-12, 87, Fig. 3, as Rosso, for the figure of Eve in the S. Maria della Pace fresco, and as reflecting the study of Raphael. Carroll, 1987, 6, 21, 66-68, no. 6, with Fig., as Rosso, 1524. Franklin, 1988, 324, 326, pointed out the main figure is drawn over the light sketch at the left and that a few hatching lines out off at the right edge indicate something was cut from the sheet. Ciardi and Mugnaini, 1991, 111, as Rosso. Franklin, 1994, 130, 131, Pl. 94, as Rosso, the study of a hand for Adam’s right hand. The drawing is related to the figure of Eve in Rosso’s Fall of Adam and Eve of 1524 in the Cesi Chapel (Fig.P.17c), but is sufficiently unlike it to make clear that the drawing does not copy the painted figure. 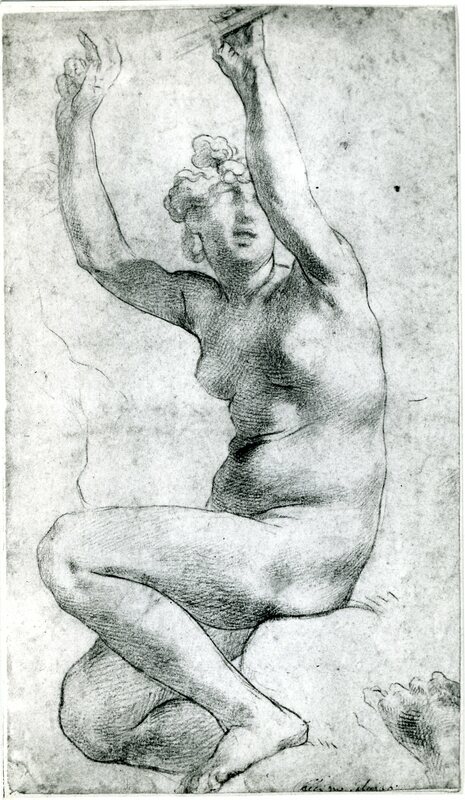 The second light sketch of part of the same figure but in a slightly different position also indicates that the drawings on this sheet are not derived from the fresco. Furthermore, it would be almost impossible to recognize the other (left) hand as copied from Adam’s, placed as the latter is so high above the viewer’s eye level. Graphically the drawing of the principal figure is almost identical to Rosso’s study for the figure of St. Sebastian (Fig.D.7) in the Dei Altarpiece. Therefore, the drawing gives every evidence of being an autograph work, and hence a study for Rosso’s fresco in Rome. Since the acquisition of the drawing by the National Gallery of Scotland the attribution to Rosso has never been questioned. The earlier attribution to Salviati, as indicated by the inscription, although wrong, gives, nevertheless, some indication of the close relationship of Salviati’s draughtsmansip to Rosso’s, at least during an early moment of the younger artist’s career.